for some reason I cannot get control rig to work in 4.21. I have enabled in the addons and restarted UE4 but still nothing. followed a couple tutorials and still doesn't work. have epic taken it out for 4.21 does anyone know please? The only thing missing or un-documented is the control rig "controls panel" diagram, everything else is doable, I suspect this is a transition period and hope the base rig is re added once updated. here is a quick video of how to use the current version and how to create animations from it. Last edited by Basement Bob; 03-10-2019, 05:52 PM. thanks for the help Basement Bob. I am really interested in the future of rigs within ue4. 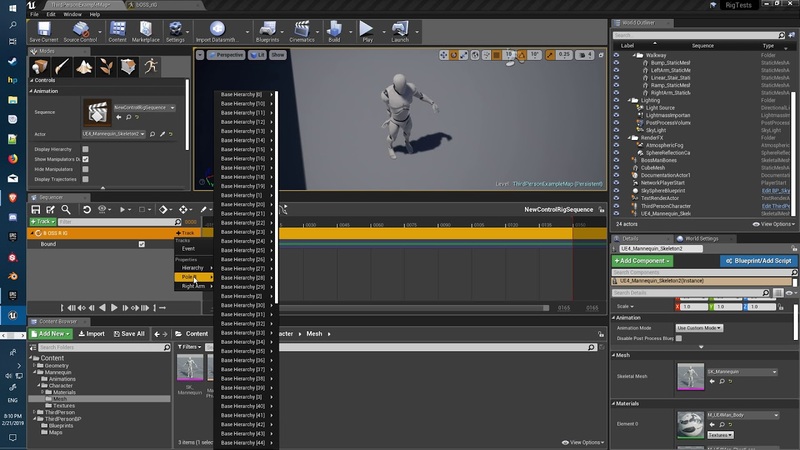 At the moment I use DAZ studio and mixamo to import animations but I would love to see ue4 have its own rig and animation implemented into sequencer. This seems to be on the cards for the future but Im not 100% sure when or if this will be fully equipped with unreal. I have looked into Allright Rig but its just a wee bit expensive. Anyone know if there are updates to Control Rig in 4.22?